Vin will be active when Vin < 0 volts and V1 will be active when Vin > 0. It should be noted that the voltages are inverted from the input to the outputs. The ideal diode circuit is equivalent to a pair of diodes except the pair of diodes does not invert the voltages. Real diodes would also have a fixed voltage drop. 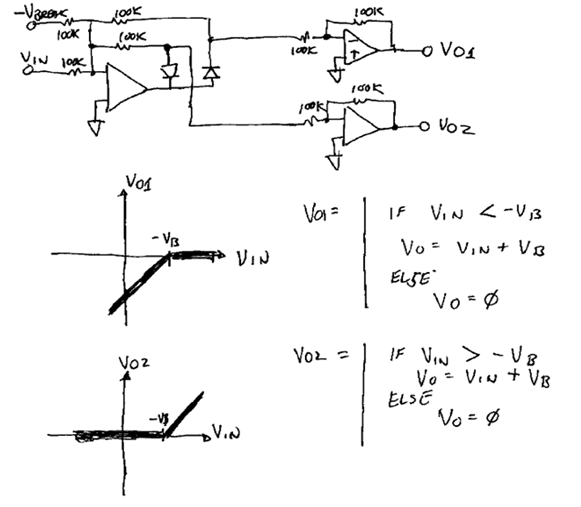 The ideal diode circuit, thanks to the opamp and the magic of negative feedback, eliminates this voltage drop. This is what makes the circuit ideal. 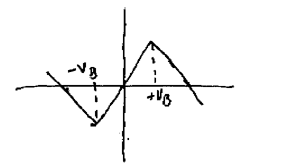 The most common application of the ideal diode is the full wave rectifier. 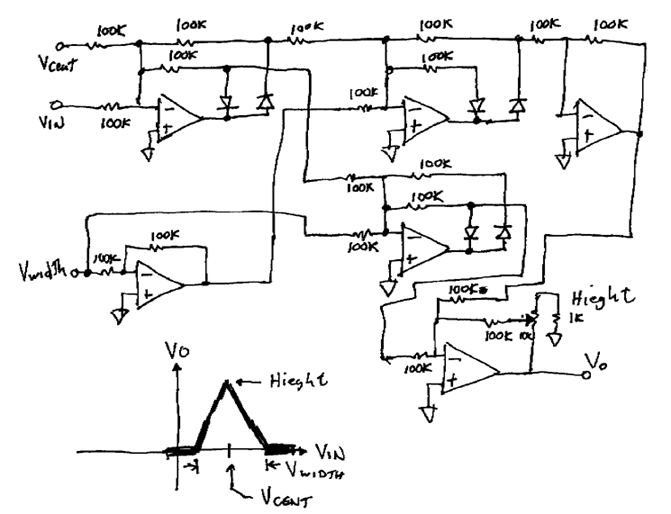 It works by summing one of the ideal diode outputs with the input. One possible use is to convert a ramp into a triangle. Another possible use is as an envelope follower. One of the most usefull functions of the ideal Diode is in piecewise linear functions. One application, for example, is a triangle to sine wave converter. More basic functions are possible. As shown the gain can be made to reverse at Breakpoint. Very complex functions can be generated. 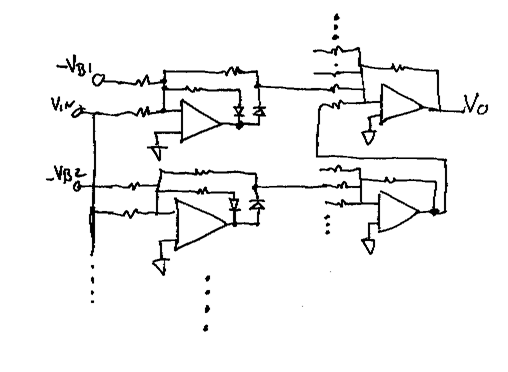 The basic circuit is shown below. Every Breakpoint requires an ideal diode circuit. Complex functions with lots of breakpoints will require a lot of ideal diode circuits. This is a very simple, straight forward application of the ideal diode. I call it a voltage splitter because the input appears on one output when VIN > -VB and the other when VIN < -VB. It should be noted that VB is added to the input. 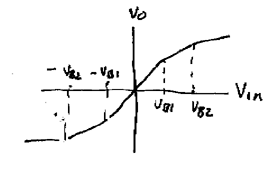 For example, if VIN = 5 volts and VB = - 4 volts you will get 2 volts on VO2 and 0 volts on VO1. You could subtract VBREAK from the outputs by adding in the inverse of VBREAK to the two output opamps. I call this one a voltage scanner because the function that is generated can be used to control a VCA that is used to select a signal. This implementation may or may not be the simplest way to do the Job, but it is one way. It should be noted that you can substitute an OTA for the height pot to obtain 100% voltage control. The one advantage this circuit has is that all the parameters are adjustable via voltage control. It should also be noted that this circuit uses the splitter. 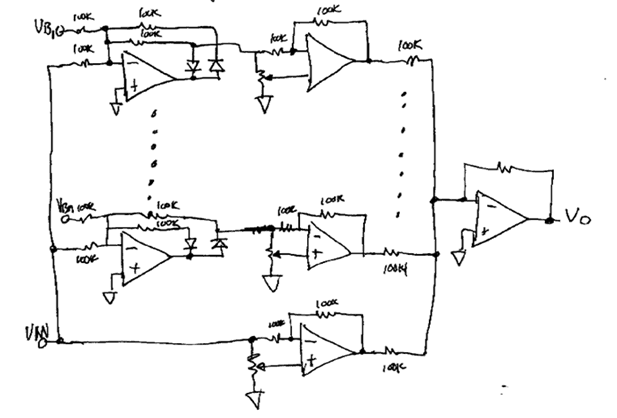 This circuit is basically a more general version of the piecewise linear function generator. It can be expanded ad infinitum by adding more diode functions. Each break has a gain adjustment so that functions are completely arbitrary. 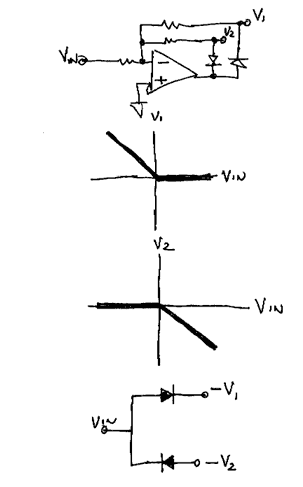 For each breakpoint required, an Ideal diode function is required.